Be Irish just for the day! With great music, food and drink, and fun friends, Houston’s Irish pubs are a great place to celebrate St. Patrick’s Day! Where is Houston’s best Irish Pub for St. Patrick’s Day? Singing “Danny Boy” with a crowd of strangers while holding a green beer in your hand sounds like the quintessential St. Patrick’s Day activity. Fortunately, night-time Houston’s energy provides a large number of Irish pubs where you can go this St. Patrick’s Day. 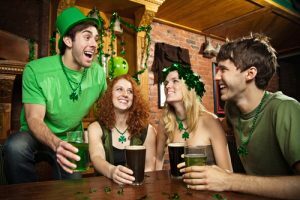 Don a green outfit, designate a sober driver, and head over to one of these great Houston Irish pubs. Live music and Irish pub fare are the standard at McGonigel’s Mucky Duck. This St. Patrick’s Day weekend, the pub will host a two-day festival of Irish music, dance, food, drink, and fun. Advance tickets are available now, so snap up your chance to immerse yourself in Irish American culture and feel the green energy. With a name like Lucky’s Pub, of course, it’s an Irish bar. This year marks their 12th annual St. Patrick’s Day festival. The party starts Saturday night and continues all day Sunday at both hopping Houston locations and their always-electric Katy location. Advance tickets, parking passes, and VIP access tickets are available. Purchase them today to lock down your St. Patrick’s Day weekend plans. Even though Shay McElroy’s Irish Pub is mere steps away from a Metro Train stop in downtown Houston, the patio and indoor seating harken to the pub’s Dublin roots. The pub’s centerpiece is a richly detailed 19th-century bar that owner John McElroy had shipped from Ireland. Pizza is one of the last foods that comes to mind when you think about an Irish pub. Suspend your disbelief when you go to Kenneally’s. Their Shamrock Pizza is topped with cheese, mushrooms, onions, green bell peppers, and corned beef. You didn’t see that last topping coming, did you? With such an eclectic bunch of toppings, there’s no reason not to pair it with one of their many Irish whiskeys. With the bar’s fun electricity, rating your favorite whiskey could be a really fun experiment. Save More Green for Your St. Patrick’s Day! The spring is a perfect time to shop Texas electricity rates. Prices are coming down from the cold winter months, and they haven’t risen back up to summer prices. Switching plans could put cash back in your pocket! Reducing the amount of money you spend on Houston electricity means you can spend more on revelry. Compare Houston electricity plans now to see whether you are paying too much.